Life is full of ups and downs, challenges and triumphs. There are many ways individuals handle their ability to process events and emotions, and talking to a professional can be one of the most beneficial practices. Research has shown that when verbalizing your feelings to another person, in particular, a professional, emotions including anger, sadness and pain become less intense and have a significant therapeutic effect on the brain. Releasing your worries (even ones you may find insignificant) is always good for your mental and emotional wellbeing. What kind of help or what kind of professional should I seek out? The two core services aimed at helping people through trauma, depression, anxiety or clarity in their lives tend to be Therapy and Coaching. Both are extremely beneficial for recovery, growth and success, but with very different methods of treatment and application to a patient or client’s life. First and foremost, therapists, whether classified as psychologists, psychotherapists or counsellors, can help you learn how to manage your mood and emotions, how to deal with stressors and work on short-term and long-term goals to help you achieve your therapeutic goals. Psychologists work with people in both categories, those who have a psychiatric condition or mental illness and those who don’t but would like to improve their lives and achieve their health, relationship and career goals. The American Counseling Association published an article likening therapy and life coaching to step-siblings; sharing similar traits, but each using different approaches. While life coaches focus on creating a new life path in order to achieve goals, therapists look into emotional resolutions to past problems in order to move forward as part of their counselling service. Each service can be broken down further into some fundamental traits to help patients/clients make the right choice. For those looking for a long-term solution for trauma, relationship issues, disorders of the mind (mental illness) and other medical diagnoses of the mind, therapy with a qualified psychologist or counsellor may be the right choice. Used by everyday people with normal, everyday challenges, it can be best to think of a therapist as the best listening friend you can have, accepting you just as you are. Therapists can offer coaching as well and can work in a solutions-focused and results-driven way to help you to achieve your goals. For a results-based, future-focused and short-term solution, a life coach may be the right fit for you. They look to provide solutions to your problems to get you to the next stage in your life. Typically, a life coach will be present for 3-6 months to help you take steps to reach your goals, such as work-life balance, a new promotion or achieving financial independence. A life coach is much like a sports coach, encouraging practice, holding you accountable and cheering you on. After reflecting on your own situation and finding an alignment to either of the solutions above, you can and should take the first step to begin your recovery or growth journey. 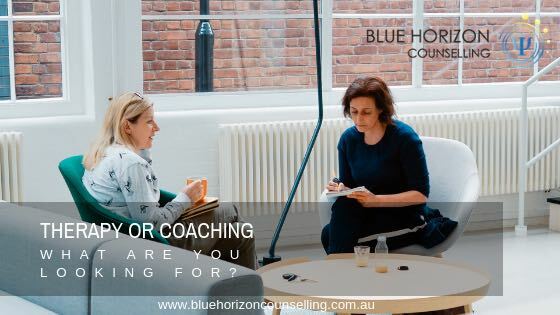 If the above examples and fundamental practices of therapy resonate with you, Blue Horizon Counselling offers many services and great availability for sessions to suit your needs. 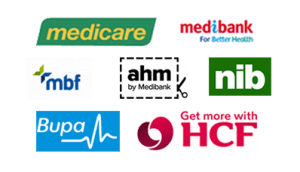 You can find out more about our offerings here, or contact us, or call 0403 866 997 to book an appointment today.